Swimming is often a go-to activity at this time of year as there is lots of fun to be had and energy burnt, whatever the weather!! 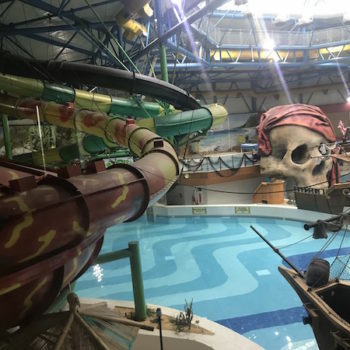 Unfortunately, we currently don’t have an indoor waterpark in Leeds but there are lots of options within an hour (ish) drive of Leeds. 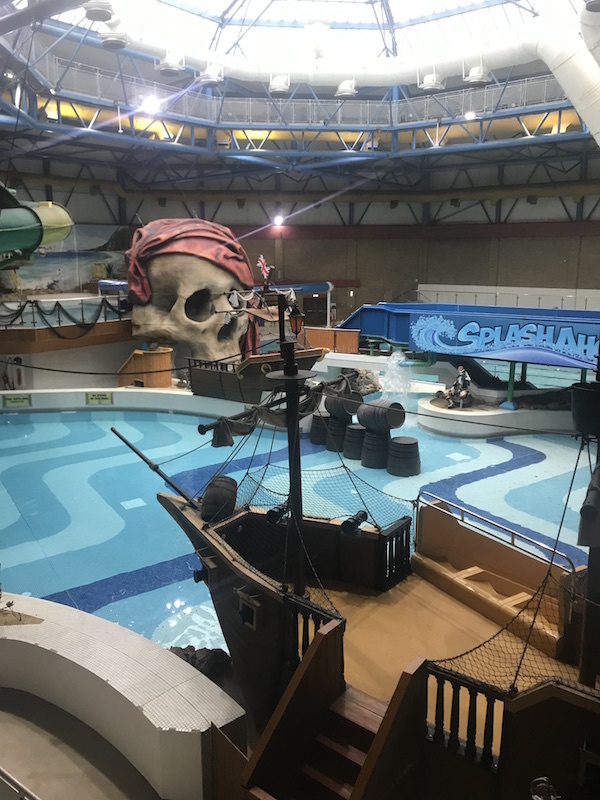 We went here for the first time earlier this year after hearing great reviews from others in the North Leeds Mumbler chat group and the kids loved it! It’s in the middle of Barnsley (worth getting the satnav loaded as it’s down a backstreet) but only takes 35 minutes from North Leeds. Last summer they opened a dedicated area for younger children, Barnacle Bay, it says it is suitable for the under 8’s but I would suggest it is more suited to under 5’s. The pool in Barnacle Bay is shallow and there are lots of water features, a mini slide, a submarine to play in and lots of squirting water!! My 5 year old was at the in-between age in that he found Barnacle Bay too young but just wasn’t ready for the big slides. 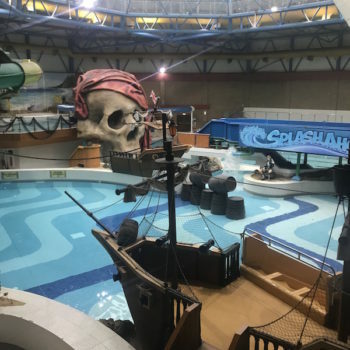 In the main pool there is a Pirate Ship which has a slide coming from it and water cannons to squirt! We also spent time in the main pool practising swimming and jumping in whilst daddy and older Mini Mumbler went on the main slides. There is a large mixed gender changing area, lockers (you need a £1) and showers but these got very busy. You can either pay for a 1.5 or 3 hour swim, we found that 1.5 hours was plenty especially for the youngest Mini Mumbler. My advice would be to get there early. It opens at 10am and we got there for when it opened and just had a 5 minute queue. When we left at 11.30am there was a large queue. You can book priority tickets online to avoid the queues. 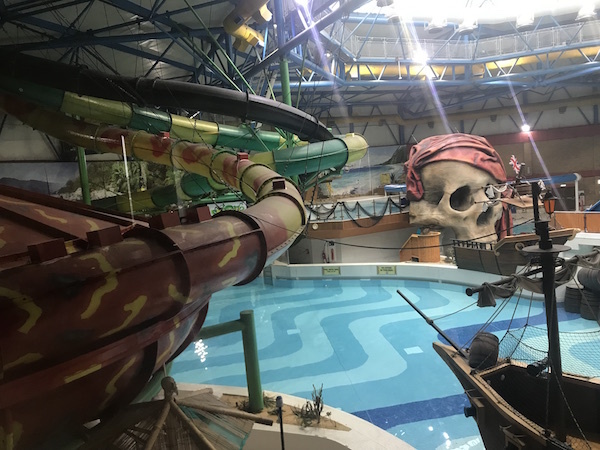 Calypso Cove is part of the larger leisure complex at the Metrodome and there is also a bowling alley, restaurants and games area. There is lots of free parking available. Make sure you check the admissions policy before visiting regarding adult: child ratio. Price: 1.5-hour family swim (without priority booking) is £24.00. We had a visit in-between Christmas and New Year and had to drag the kids out! It took us about 45 minutes from North Leeds, even when Huddersfield Town were playing at home! The Splash Park is ideal for all ages and is a nice size meaning that if you have confident swimmers you can see them on most parts of the splash park. A key point to note is the two main slides have a height requirement of 1.2metre and they are strict on this. The Splash Park operates a band system which gives you 90 minutes to enjoy the park but also means it is never too busy. The Splash Park has a fun pool for the younger ones which is warmer than the main pool and has a few ‘animals’ which the children can sit and slide on. In the main pool there is a lazy river, toddler area with slide, “things” to turn and twist and a water bucket. There are two slides (a water flume and Slidewinder) which you ride in inflatable rings (single and double), three water guns and an area where you can have free play. We have been to a few “Waterparks” when on holiday and both my husband and daughter have not stopped talking about the Sidewinder! It doesn’t look that much from the ground but apparently, it feels almost vertical when you go down it! One thing to note is there is a lot of squirting water, my two wanted their goggles on! Apparently included in your entrance there is also another pool where you can do length swimming but we never made this! The shower and changing rooms were clean and we had no problem getting a changing room. You need a £1 coin for the locker system. There are a cafe and snack bar (open when cafe shuts) on-site for refreshments. There are other activities including climbing and soft play as part of the Leisure Centre if you wanted to make a day of it. Price: Family ticket for 90 minutes in the splash park is £15.95, pre-booking is advised. In addition, you need to pay for parking at the Leisure Centre but it is not expensive. ** Check timetable for Splash Park before visiting as Huddersfield school holidays can be different to Leeds. We haven’t visited Doncaster Dome but our sister site Doncaster Mumbler have and helped us with an overview. The Dome is approximately 50 minutes from North Leeds. Swimming in The Lagoons (7 interlinked pools) at the Dome is fun for all of the family, from parents with toddlers, to teens and tweens who want the fun packed action of the big slides! The slides include The Falls, Serpent and The Blackhole, children have to be 1.2 meters tall to use the slides. There is a lovely, quieter paddling area for little ones behind the slides, which has a little climbing frame, plus jets of water and fountains that are fascinating for babies and toddlers. There is a larger pool for some proper swimming and then there is an area which has fountains, jets, airbeds and a hot tub, plus an outside area with rapids if you’re brave enough in this weather – although it is heated! There are plenty of family changing rooms, you need a £1 for the locker system. If you’re planning to make a day trip of your visit the Dome also have a playzone, soft play area, bowling and ice rink too! There are numerous places serving food throughout The Dome. Price: Family ticket for the swimming area is £20 during the weekend ‘Big Splash’ sessions. The Dome currently have an offer where a family of four can skate and swim for £25 on the same day (need to book online for offer). There is free parking available onsite. Richard Dunn Sports Centre has been recommended by other Mumblers as somewhere to go for indoor water fun. The sports centre is approximately 35 minutes from North Leeds. The Jungle Adventure Pool features include a 25m leisure pool with Cobra black hole waterslide and Zambezee tyre ride! You have to be over 1.2 metres to ride the slides. The slides are only open weekends during term time, timetables do change for school holidays so check the website for up to date details. Price: A swim and slide family ticket is £20.75. Bramley Baths have a ‘Family Fun’ session on a Saturday and Sunday, the sessions include an inflatable (first Saturday of the month) and a range of floats, toys and balls. Tadcaster Community Swimming Pool has various ‘fun’ sessions including Parent and Toddler sessions on a Tuesday and Friday (10am-1pm) which include toys, floats and music to add to the excitement! On a Saturday (3-4pm) they have a fun session which includes a small inflatable Viking Boat in the main pool and there are toys, floats and music! Hydro Swimming Pool, Harrogate has a ‘Fun Session’ on a Saturday and Sunday The pool is filled with floats, toys and the large inflatable aqua run. (You must be able to swim 25m unaided to use the aqua run.) The fun session is aimed at children 8-16 years. If you fancy a drive to the coast Alpamare at the North Bay in Scarborough gets great reviews on our sister site Scarborough Mumbler. The waterpark includes four slides, wave pool, splash and play zone and outdoor heated pools! Bridlington Leisure Centre also has a great splash zone with two slides and an interactive waterplay structure. *Prices and details correct at time of publishing, January 2019. Please check timetables before visiting as changes can be made especially during school holidays. Also, make sure you check the adult to child ratio at individual waterparks prior to visiting.